Home / Reviews / Eddie The Eagle Blu-ray Review! Does The Family Friendly Film Live Up To It’s Real Life Story? 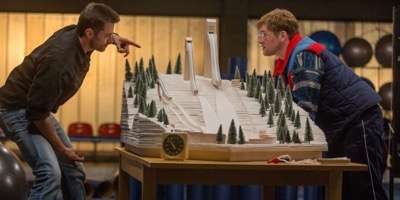 Eddie The Eagle Blu-ray Review! Does The Family Friendly Film Live Up To It’s Real Life Story? When it comes to real life stories, film has a spotty record. For every Born on the Fourth of July or Apollo 13 there’s a Patch Adams or Pearl Harbor in it’s wake. Now comes Eddie The Eagle, the true life story of wannabe Olympian, Eddie “The Eagle” Edwards who defied everyone’s expectations and wouldn’t let anyone tell him how he should live his life. 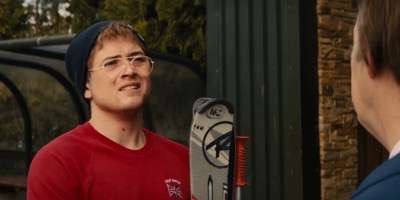 Eddie Edwards (Taron Egerton) is a dreamer, who at a young age had problems with his knees that left him in a brace for most of his adolescence. This did not deter his ambitions, in fact it only made his resolve stronger. He was going to make it to the Olympics, one way or the other. His parents want Eddie to work his father as a plasterer and live a normal existence, but Eddie has an almost steely resolve. He will not go down quietly into the night. When he goes with his father to work, he sees a downhill run snow track and it hits him like a ton of bricks. He’s going to learn how to be a downhill skier. 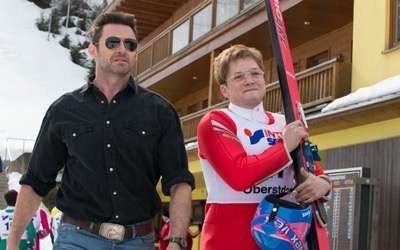 Eddie heads to Germany, where after several bumbled tries to be a skier, he gets befriended by Bronson Peary (Hugh Jackman), a hard partying former skiing star. After trying to discourage Eddie and get him to go home, Bronson eventually relents and gives Eddie the coaching he so desperately needs. While the film is based on a true story, it follows a fairly formulaic approach, Eddie can’t win, Eddie can’t make it to the Olympics, Eddie defies the odds, game over. 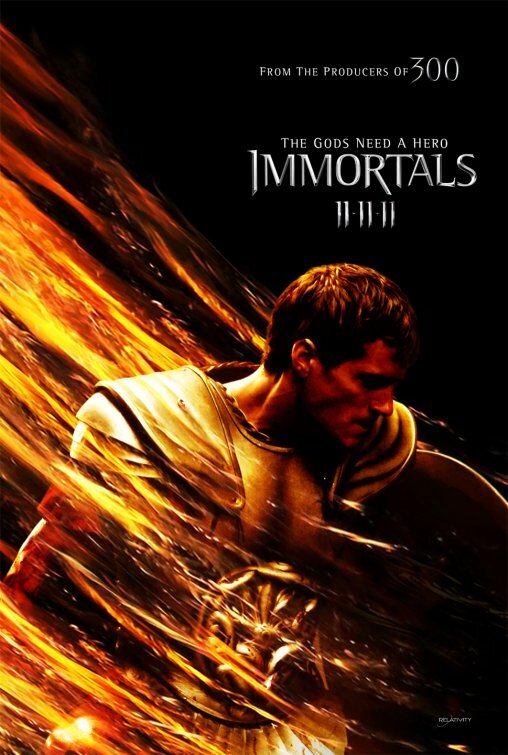 This does mar the film, which is unfortunate because for the most part the film in an enjoyable film that the entire family can watch together. It’s really unfortunate because the parts that were most strikingly formulaic are the ones that differ from the actual true story of Eddie Edwards. Eddie was a well known skier and not just a kid from Britain. It’s sad to me because it would have been just as good of a film if they followed more of Eddie’s real life story. 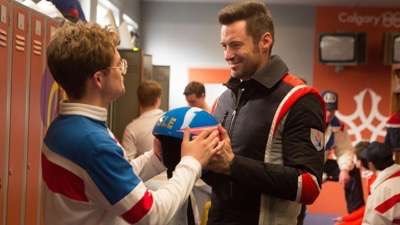 Both Hugh Jackman and Taron Egerton bring the film alive. Taron Egerton especially has the whole film on his shoulders and he delivers a wonderful performance. He’s at one comedic without lapsing into caricature. Hugh Jackman, is also very good even though he’s still Hugh Jackman. I didn’t necessarily buy him as a grizzled alcoholic but he has great chemistry with Egerton and they make a winning combination. Eddie The Eagle arrives on Blu-ray in a fine transfer thanks to 20th Century Fox. The details are blear and bright, with the shots on the slopes with the crisp white of the snow in contrast to the warmer earthier tones of the training sequences. In the close up shots you can really see the actors subtle gestures which really enhance their characters. Let the Games Begin: Soaring with Eddie The Eagle – This is a 45 minute EPK style featurette with behind the scenes footage, interviews, and clips. Overall, while I really enjoyed the film, I just wish they stuck to the real life story more. As it stands, the film is a very cute tale and on the plus side, you can watch it with your whole family and everyone will like it. That in and of itself, is a treat. I suggest you check this film out, you won’t be disappointed. 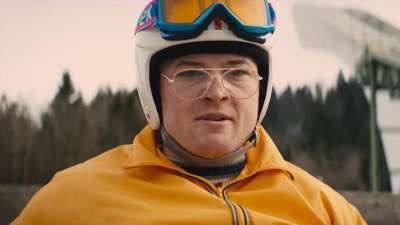 Eddie The Eagle is out now on Blu-ray! The Movie Maven Gets A Contact High From Harold and Kumar and Says She Wants To Cuddle Up To Chris Evans With a Cheap Glass Of Wine As She Reviews The Top New Releases on Amazon, Netflix and Redbox!